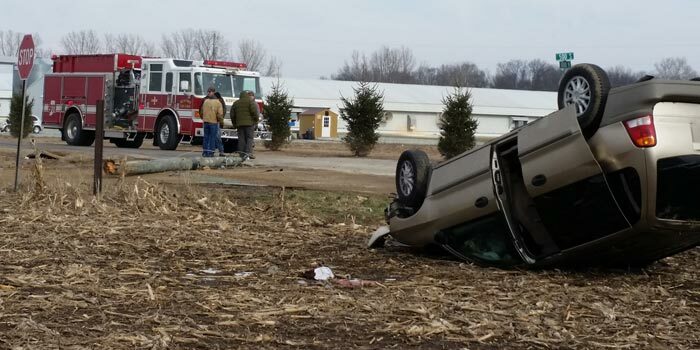 MENTONE — One person was flown to Parkview Hospital, Fort Wayne, following a rollover accident near Mentone. Phillips regained consciousness and told police he had been southbound on CR 1000W when a blue pickup truck attempted to pass him, cutting him off and sideswiping his vehicle. According to Phillips, the impact caused him to lose control of his van, which went off the road, snapped a utility pole and came to rest upside-down in a nearby corn field. Responders found the power lines strewn across the road. Phillips told police he had been buckled in and had crawled out of his vehicle before losing consciousness. Witness accounts were somewhat conflicting, however. Witnesses stated Phillips was ejected from the vehicle. Police were also unable to find marks on the vehicle that would have been consistent with Phillips’s account of the blue pickup truck.